Every year the arid landscape of the Northern Cape in South Africa is transformed into a kaleidoscope of color. Wild daisies, along with other flowers, bloom in whites, yellows, oranges, magentas and reds, carpeting the fields and road sides in natural splendor. The flowering region covers a large area from the little town of Garies in the south all the way north to the Orange River. Its western border is the Atlantic Ocean and it reaches across the province to Pofadder in the east. In an attempt to protect the land and ultimately the flowers, the Namaqua National Park was established. This is where visitors will get an unspoiled view of the environment as it erupts in color. Visiting the Northern Cape in the Flower season (July to September) is a must for nature lovers. The season is dependent on a good winter rainfall. Throughout the winter dormant seeds lay scattered on the ground and soak up the winter rains. Good rains in May and June and a decent soaking once a week during July and August usually offer the best results. There is no accommodation in the National Park, but the surrounding towns offer great options of hotels, guest houses, bed and breakfasts and camping. The park is open to the public but a fee is payable on entry in the flower season. Self drive tours are welcome but a 4 x 4 is needed if travelling along the coastal section of the park. Also try the Goegap Nature reserve which is located south east of Springbok or the Richtersveld mountain desert area. Both offer amazing vistas of succulents and wild plants such as gazanias, varkiesknol (conicosia), sporries (heliophila), katstert (bulbinella) and pietsnot (grielum humifusum). A road trip to see the flowers takes the traveler through quaint little towns such as Garies, Kamieskroon, Springbok, Pofadder (Puffadder), Soebatsfontein (Weeping fountain) and Port Nolloth. 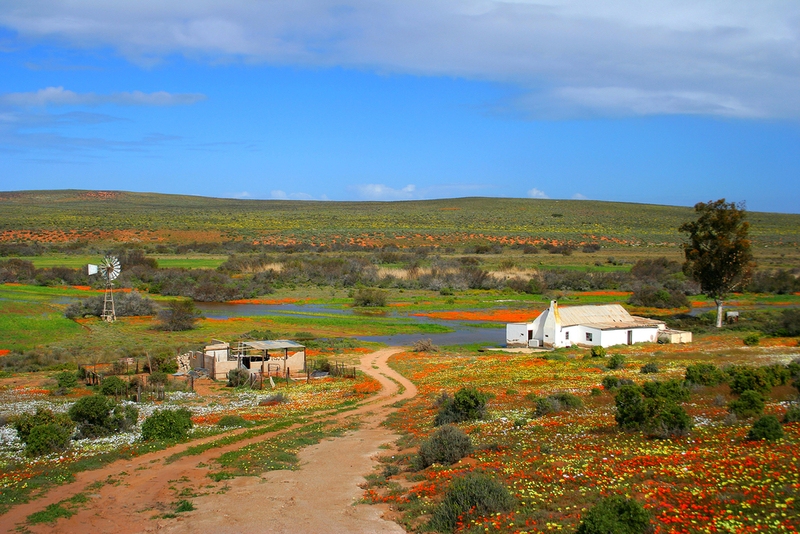 A worthwhile stop in flower season is in Kamieskroon’s Skilpad Wild Flower Reserve which is part of the greater Namaqua National Park. A good base is the town of Springbok which is the provincial capital and offers easy access to all the routes. In addition to the flowers, the little towns have an attraction of their own and celebrate the flowers by decorating their streets. Each has a unique story to tell about how they came about. Perhaps it was with a mission station or a rich copper or diamond deposit was found nearby. Copper was discovered by Europeans in the late 1600’s. The stories are rich, the people are interesting and the landscape is breathtaking. This entry was posted in All about travel, Themed travel, Top attractions and tagged About Namaqualand, flower shows in South Africa, Goegap Nature Reserve, Namakwa flowers, Namaqua National Park, Richtersveld, Road trip in Northern Cape, wildflowers of South Africa by Findtripinfo.com. Bookmark the permalink.